Ceramic tile, an ancient art, remains at design's cutting edge. It is one of the oldest building materials, long used as a surface covering or flooring and protection. There is a sense of timeless artistry with tile, yet we can still see some modern twists in what is available today. The process of making tile from clays and other earth materials is still basically the same as it has been for centuries. The clays are mixed, moistened, and shaped in mechanical presses, then fired at temperatures that often go beyond 2,000 degrees Fahrenheit. The three main types of tile produced are wall, mosaic, and quarry. Wall tiles are produced in porous, neutral-colored materials, and a color film is glazed on one side. The wall size is usually 4 1/4" X 4 1/4". Mosaic tiles are smaller and have less than six square inches of facial surface. They are used primarily for countertops and light-duty floors. Quarry tile units are 6" X 6" or larger, and they are applied as heavy-duty flooring, patio flooring, and even used on fireplace hearths. Today's tile is no longer just the 4 1/4" X 4 1/4" solid color bathroom squares you may be used to seeing. There is a current demand for hand-painted designs with rich textures of European and American arts and designs. Tile manufacturers will continue to produce patterns, colors, and textures that reflect the consumers' desire for natural products, particularly the look of stone. We should see a continued proliferation of stone looks, with a variety of aesthetic looks. Today's modern production techniques can assure that virtually every tile looks different, giving each piece that old, hand-made style. Natural, earth-toned colors continue to be the most popular, particularly the light neutral tones. Tile prices vary widely from one pattern to the other. The art type tiles are at the high end, and they can cost from $5 per square foot up to $100. On the low end, tile could cost from $1.50 to $2.75 per square foot for all the setting materials, and $4 to $8 per square foot of labor. The installation should be done by your remodelers tile-setter subcontractor due to the specialization of labor and the pure peace of mind of the warranty (just in case something goes wrong). Also, you can have your remodeler buy your hand-picked tile and setting materials so you won't have to figure out exactly what to buy on your own. should be used on countertops and walls, and thinset can also be used. The biggest mistake we see in our trade is when tile has been applied directly on the drywall. This can lead to major repairs further down the line. 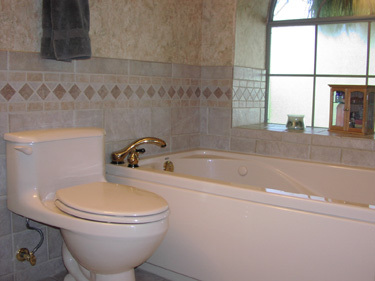 The best advice would be to use a remodeler familiar with tile. Floor tile styling trends continue toward larger unit sizes. The stone look translates more naturally to larger sizes, especially 12" X 12" and up. The larger sizes -- 16" X 16" and 18" X 18" -- are becoming more common throughout the country, and in upscale homes even larger sizes like 24" X 24" are not uncommon. Porcelain floor tile continues to grow in importance in the tile market, and technology now allows for a variety of looks, including stone, slate, and travertine. Look to also see floor tiles that combine both matte texture and polished texture on the same piece of tile for a striking contrast, and don't be surprised to see floor tiles being used on the walls and even countertops to provide unique accent trim pieces. Tile is seeing some advances in this modern day, but it still remains an old art. Using tile in your home can create an aesthetic unique to your home and can convey a sense of an ancient tradition.